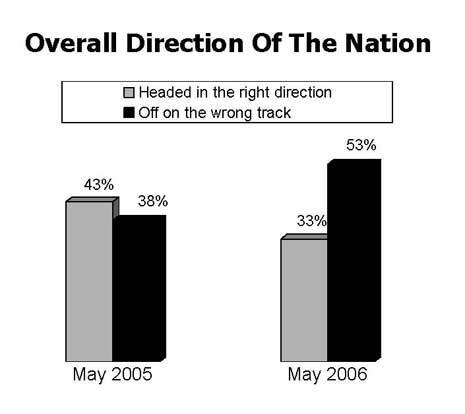 Our June 2006 survey showed the nation’s college students were unhappy with the current path of the country, but they expressed little interest in becoming involved in government. In a poll conducted by Hart Research Associates for the Panetta Institute, 53% of students said the country was headed in the wrong direction, a jump of 15 points from a similar survey conducted in 2005. 71% said they were not interested in careers in public service.